Denise initially cultivated her brand-building approaches through several high-level positions in advertising and client-side marketing. She served as lead strategist at advertising agencies; was the vice president/general manager of brand and strategy - garnering major corporate awards; and has run her own firm as an independent consulting partner since 2004. 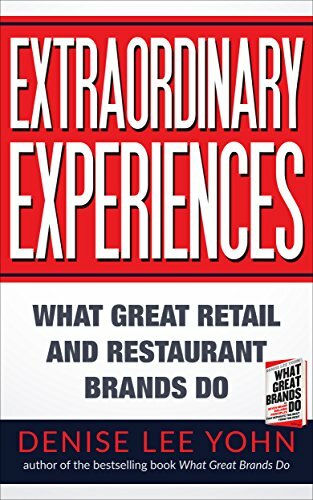 An influential writer, Denise is the author of the best-selling book What Great Brands Do: The Seven Brand-Building Principles that Separate the Best from the Rest (Jossey-Bass) and the new book, Extraordinary Experiences: What Great Retail and Restaurant Brands Do. She enjoys challenging readers to think differently about brand-building in her regular contributions to Harvard Business Review, Forbes, Seeking Alpha, and the well-regarded monthly column Brand New Perspectives to QSR Magazine. Gail Davis: Denise Lee Yohn is going to share with us from her more than 25 years of experience helping organizations take their brands to new heights. You're going to learn how to get more power out of your brand by applying the innovative [00:01:00] brand-building philosophy that she developed while working with such companies as Target, Oakley, Frito-Lay and Sony. Denise is the author of the bestselling book What Great Brands Do, and she has contributed to media outlets, including The New York Times, The Wall Street Journal, and the Harvard Business Review. Please, welcome to the GDA Podcast Denise Yohn. Kyle Davis: Hey, Denise. How are you? Kyle Davis: Good. I think it'd [00:01:30] probably be a good starter, because it's a great thing that we had off line and it's a perfect question that you tee balled up for us. What inspired you to get into this work of building these brands, which then pivots into the book that you wrote, What Great Brands Do? Could you speak to how you came into that role and what you've learned over the years? Denise Yohn: Yes. I love brands. I am just fascinated by them as a business [00:02:00] person, and also very much a consumer of many of them, an active, passionate consumer of many of them. I think it comes from my, I guess, my fascination with people in general. I was a psychology major and that was born out of my desire to really understand people and how they made decisions. I think it's just so interesting to figure out how brands influence consumers, how they make connections [00:02:30] with them and how they really become really powerful, valuable sources for people and in the world. I've devoted my career to learning about them and I then wanted to share what I'd learned from that in my book. Kyle Davis: Very cool. I'm a big fan of brands, as well. One of the things that I like to do, especially when I go to sporting events [00:03:00] ... I know this sounds really weird, but when I get the Dallas Mavericks games, for instance, I like to sit around and look at the logos that companies had and just try to figure out how they came up with that idea of a logo. I know that a logo isn't necessarily the brand in total, but it gives you good ideas to what their thinking is. I've recently had an experience where I'm sitting in the audience of these Mavericks games, and I wasn't paying attention because we're not good this season, and I'm just looking [00:03:30] at the logos and go, "Why did they choose that? It's so cluttered, it's hard to read, it's so packed." Whereas you look at this other brand that's like city and you see the umbrella and you see this and that. How do you unpack that, I guess, if you will? Denise Yohn: I think a great brand starts with a very clear and crisp foundation. I define a brand basically as what you do and how you do it. [00:04:00] I think in business school, they'll tell you that the official definition is something like your brand is the bundle of values and attributes that describe the value you deliver to customers and the way that you do business, yada, yada, yada. Basically, they're saying, "Your brand is what you do and how you do it." What I found is that when you think of and you use your brand in that way, it has so much power, because it not only informs something like a logo design, but it informs [00:04:30] everything that you do, so that everything that you do really communicates and expresses and delivers your uniqueness. When you look at a logo ... I think, you're right in that, it is a representation or expression of your brand, but I hope that what everything else the company does gives you that same impression, right? Kyle Davis: Mm-hmm (affirmative). One of the things that we've talked about prior to going to record was our [00:05:00] mutual love for coffee. I've talked about this coffee shop in San Francisco called Front Coffee. I had to look them up to see if they're still open, just so I could recommend it to Denise. What instantly throws me, and like you can just tell that the designer of the website and the "brand team" were really some people from like the tech minimalistic, or school of minimalism. It's beautiful, [00:05:30] it's simple, it's clean. It tells you what they're trying to convey, nothing more, nothing less. I want some coffee. Do you have a sense of ... when you're looking at companies and you're talking about brands where they're pulling from and then are there major themes, if you will, within branding, per se? Denise Yohn: First of all, it's important to differentiate between branding and [00:06:00] brand-building. If you'd allow me just to go on a little bit of a rant for a moment. Branding, if you think about where it came from, is a term from way back in the Old West, when people had cows and they needed to make sure that people wouldn't steal their cows, and so they would brand their cows with some sort of symbol to show that they owned it. I think when you think about that as a business principle today, it really [00:06:30] doesn't make a lot of sense, because just because you have a unique symbol doesn't really convey any value to a customer, particularly at this point when so many ... there are so many talented designers out there that can really, I think, make a very beautiful, creative, unique, stunning expression of a brand. What I work with my clients on is brand-building. How do you actually develop [00:07:00] this asset, this thing that creates value, not only for customers and helping them make decisions and get a good sense of your brand or what you offer, but then also that's valuable to you as a company? Something that you can use as a north star, or a guiding light to say, "Everything we do needs to be aligned with this vision that we have." Having said that, when you think about [00:07:30] different types of brands, certainly, there are different roles that brands play. For example, there's the establishment brand, brand that's been around for a very long time, whether that's IBM, or Macy's, or even Coca-Cola, to some extend. Then there's the challenger brands. The brands that really try to disrupt the industry and break with convention. That might be Uber or Virgin or even Southwest Airlines. Then [00:08:00] there are like populist brands. Brands that are very mainstream, maybe like a McDonald's, or Walmart, even like a Google or a Facebook. There are different types of brands, but what I think is really the opportunity is for each company to identify what is their unique brand purpose? What is their reason for existing? Then what are their defining core [00:08:30] values? The things that they believe in that are going to not only shape how they operate inside their company, but also how they express themselves to the outside world, and things like a logo and this beautiful website that Front Coffee has. Those things need to be grounded in this real sense of values that are infused in everything they do. Kyle Davis: I'm going to say one final thing and then let my mom get in a word in advice. One of the things that I loved when I was working in San Francisco, working [00:09:00] for a company like Square, is that their whole mission statement, the ethos, the north star, if you will, to use your phrase, was the slogan of the company. The company slogan was, "Make commerce easy." That was ... At the end of the day, we asked ourselves ... I was on the sales team, but, "Is what we're doing as a sales team making commerce easy for these little guys who are just trying to [00:09:30] get on the Square platform? Is what we're building making commerce easy?" It's the final question that you always come back to. I think having a company like that, that in a single sentence can just pull at everything, is beautiful and great, but I'm sure you can speak to the challenge of just coming up what is a beautifully simple thing and just consolidating it to one phrase, one word, or whatever, to [00:10:00] really make commerce easy or life simple, or the brand, true north really pop out. Denise Yohn: Yeah. I think that a common challenge I see with businesses is that there's so many things they could do. You see that then in the difficultly of articulating [inaudible 00:10:23], simple brand purpose, or a mission statement, as you called it for Square. It's like, [00:10:30] "Oh, well, you know, we wanna do this and we can't do that and what about that?" I think that when you look at some of the world's greatest brands, whether it's an Apple or a Nike or a Starbucks, they have a very clear, focused brand purpose. In each of those cases, it's fairly, [inaudible 00:10:56] pivotally articulated [inaudible 00:10:59] [00:11:00]. It's well-articulated in a simple statement, but I think it's really the effort behind narrowing it down to really why do we exist? What is the dent we want to make in the universe? What is the cause, the reason why we exit? What would be missing if we no longer existed? I think that if you do the hard work to really distill everything down into that one priority, then I think actually articulating can [00:11:30] be kind of easy, but then, again, then you have the whole other hard work is to then stay committed to that. One of the principles in my book What Great Brands Do talks about great brands commit and stay committed. I think what you talked about like at Square, always coming back to, "Make commerce easy," it has to be an ethos, it has to be the thing that you just lock in and execute on relentlessly. Gail Davis: Since brand is your focus, I'm sure you have spent time thinking about your [00:12:00] own personal brand. I would be curious what makes you different from other speakers that are out there talking about brand and branding? Denise Yohn: Yeah. I guess there's probably a few things. One is from like a content level. I think that there are a lot of people that talk about the branding side of things, what we were talking about in terms of logos, or creative expressions, design. Even now when you get into advertising [00:12:30] and especially because there's so much interest in social media and digital marketing. All of those elements of brand expression and communication. While all of those things are extremely important and I love hearing speaker talking on that topic, I think what I try to do is to get people to focus on the foundational, essential brand. Again, what is your purpose? What are your values? Make sure that you have your brand strategy, and operations, [00:13:00] and customer experience clear and well-differentiated, and creative, and memorable. Then you can work on the more branding, expression elements of it. I think from a content standpoint, what you'll find is a different perspective on how to build a brand. It's not just about what you say, it's about what you do. Gail Davis: When you're going out to give a talk, how do you go about preparing for [00:13:30] the audience? Denise Yohn: It's a process ... Actually, one of the things I really try to pride myself on is customizing every talk I give. Nothing I give is canned. I really am trying to be very thoughtful about what it the unique presentation I need to make for this client or this opportunity. I ask myself three things. One is, "Why am I the absolutely right person to be giving this talk? [00:14:00] What is it about me and my message or my content that needs to be said?" Two, "What are the challenges that my audience has?" Really, trying to understand if I'm speaking to an association, like what are the category challenges if I'm speaking to a company? Specifically, I spend a lot of time prepping upfront, so I understand specifically what their market challenges and needs are. Then, third, [00:14:30] "What do I want my audience to do as a result of hearing me speak?" A real emphasis on action. I guess that's the other thing I was going to say about what differentiates me is that I really want people to be changed, to do something different as a result of my talk, so I'm going to be very content-rich, hard-hitting, and hopefully, provoke people to actually do something different as a result of my talk. Kyle Davis: [00:15:00] One of the things that is one of those constant strings that great speakers that we've had on this podcast have always brought to their talks, specifically when they talk about business or relationships or culture, anything else is this constant need for new content that's based in research and that's rich and tailored to, not just a speaker's audience, because you don't just speak, you also do [00:15:30] consulting work. If you go and do consulting, here's what you're doing. If you could, where are you getting this rich content and how are you tailoring it? What are you doing? I know you've mentioned you have expectations that there's a takeaway and that the takeaway moves into action, but how are you shaping all of this and bringing forth something new, and something fresh, and something that really resonates? Denise Yohn: I'm a voracious reader. [00:16:00] I've already probably read, I want to say like eight books this year, which ... There's a specific reason which I will get into this year that I'm really reading a lot more than usual, but reading a lot of books, reading a lot online and doing a lot of research. As I started out this conversation, I love brands, so I'm soaking all of this in and I'm always looking for that anecdote or [00:16:30] that example or that case study that ties into one of the points that I want to make and then I keep a library of different ideas. If I am constantly learning, then I make sure that my audience is going to learn, also. That's really why I spend so much energy reading myself. Kyle Davis: Got it. When a client, whether it's a speaking [00:17:00] client, or it's a consultant client, they come to you and ... we get the voracious reader, because I'm one of those, too. I've read so much actually for a week I darn near went blind when I was in school, it was ridiculous, but you can do cornea damage, apparently, from reading too much. Kyle Davis: Yeah. When you're going in there and you're pulling from these 25 some years of experience and being just a real voracious reader and [00:17:30] going out and pulling what you can. When you're compiling this and you're compacting it and you're making it presentable, is this something that is just easily transferable? Is this something that you really work to simplify the message? I guess what I'm trying to get at is that one of the beautiful things that I like about great brands, like, "Make commerce easier," slogans is that it's a simplification of everything. I have an idea that you do this, as well. I'm just wondering how are you delivering this to make it easy for people who [00:18:00] really aren't focused on this? Denise Yohn: Gosh, I don't know if I could articulate a specific process. I will say that most of my talks tend to be rooted in my book What Great Brand Do. In that I have seven brand-building actions. Certainly, I will emphasize certain ones over others, again, as part of my customization process. If I think [00:18:30] about it, that's the filter I use when I'm reading or when I'm researching or experiencing things, I'm like, "What principle does this exemplify?" Or in some cases, "What principle is this brand violating?" Then, I can actually point to and say, "This is why they're failing." I had just written an article for The Harvard Business Review about Walmart [00:19:00] and Amazon. I was observing that it seems like Walmart is following a lot of Amazon's lead. One of the principles in my book is great brands ignore trends and that usually means ignoring competitors and ignoring what other people are doing and you break out onto your own new ground and you actually create your own trend that everyone wants to follow. The reason why this kind of Amazon Walmart thing came into my mind was because I'm like [00:19:30] it seems like Walmart is following, when they really have been such a strong company for so many years, they should be leading. I guess that's the framework or the lens through which I see a lot of things or these actions or these principles that I really developed overseeing how other great brands have gone about their brand-building. Kyle Davis: I think lens is a beautiful phrase. I really feel like I should go back to like school [00:20:00] and read things through specific lenses. I like that. What are the seven key takeaways at a very high level? I think one of the things you hinted at is maybe sometimes they're not necessarily doing it, but more often than not, they're violating it. Kyle Davis: What are these? What are maybe just common pitfalls that people fall into? The brands fall into? Denise Yohn: Sure. I'll try to go through them fairly quickly, but let me spend the most time on the first [00:20:30] principle, which is great brands start inside. I mean great brands start building their brands by building a strong brand-led culture inside their organizations. This is already what we've been talking about, that if you're not clear about what you stand for, and if people in the company aren't engaged and motivated and aligned about that, then everything that you do on the outside is like putting lipstick on a pig. [00:21:00] Unfortunately, that's where a lot of companies start, especially up here in Silicon Valley. Every tech startup starts with, "What should our logo look like?" Or, "What should our homepage look like?" I think what often happens is then you don't have the substance behind your brand in order to actually be able to compete and create a sustainable, valuable relationship with customers. If you start inside, if you start [00:21:30] with the strong culture that's rooted into your brand purpose and core brand values, and ensure that everything you do is aligned with those, then you really have the foundation that you can build upon to afford to achieve a great brand. That's the first action or the first principle, great brands start inside. The second one is great brands avoid selling products. I think what I've discovered is that great brands [00:22:00] don't push their products on people, they don't tout their technology or promote features without linking them to values and linking them to an emotional connection and the emotional appeal that they can create for their customers. We, human beings, as emotional beings and we make purchase decisions based on how products and brands make us feel. The greatest brands out there use that to their advantage, and they really avoid selling and do more seducing, [00:22:30] I would say. Shall I keep on going? Kyle Davis: I love it. Yeah, go ahead. Denise Yohn: Yeah. Okay. Great brands ignore trends, that's what I was just talking about before. Great brands don't follow what everyone else is doing, they lead. They often challenge the convention in the industry and do something totally different. Number four is great brands don't chase customers. [00:23:00] They don't squander their precious brand equity by chasing after everyone or trying to be all things to all people. Instead, they're very clear about what they stand for and attract like-minded people to them. Number five is great brands [inaudible 00:23:16] at the small stuff in the customer experience. All the little things you do for someone in person are going to far outweigh the big things that you proclaim in your advertising. Great brands design their customer experiences with detail [00:23:30] and discipline. Then heading down the home stretch, great brands never have to give back. I know that that sounds counterintuitive, and I don't mean to suggest there's anything wrong with giving back, but oftentimes what I've observed is that companies give back because they've taken something in the first place. They're trying to make up for doing some wrong in the marketplace, whereas great brands actually create a positive impact in society, [00:24:00] in culture, in the environment by the way they run their business, so that they don't have to give back. Then the last one is great brands commit and stay committed. Once you know what your brand core is and this is what we were talking about, again, with Square. Once you've articulated that, you need to lock that in and make sure that everything you do, you're not getting distracted from that, but you really are executing on it with clarity and conviction. Those are the seven brand-building [00:24:30] actions that separate the best brands from the rest. Kyle Davis: One of the things that, to me, especially coming from the tech startup space with a lot of focusing towards how a application appears, or how this website flows, or whatever, even customer acquisition has always been geared towards the customer experience and removing every single friction point. [00:25:00] I normally don't like to talk about other people that we've done a podcast with, but we have done one recently with Tim Sanders who was like a lot of people look at, let's say, customer acquisition and they think it's cold call, get into negotiations, sell the deal, case closed. When in reality, there might be 27 different steps between then and contract signing. Then after that, there's aftercare that goes along with it. [00:25:30] It's thinking about every single step with mindfulness and intentionality. I think that's huge. Denise Yohn: That's so smart. That's why we all love Tim Sanders, right? Absolutely, I 100% agree. Kyle Davis: I've mentioned that because I just feel like ... I'm not trying to be like a hater, if you will, but a lot of companies rest on their laurels, because they've been just doing it for so long that they really haven't even thought about what customer experience [00:26:00] actually is, just because it's been going right for so long. That when ... it's the startups that catch them "off balance" or whatever, not because they're doing what their ... the end goal is better, they're just doing every little thing to make that customer experience better, the service better, and it's ... I'm trying to remember who my friend was that posted it on Instagram, but somebody was talking about there's companies that do sales and then there's companies that do service, [00:26:30] people remember service. Denise Yohn: Yeah. I think many companies that struggle with customer experience do so because, to your point, they have operated in a product world for so long. For many ages, all you needed to do was have a good product. In some cases, it didn't really need to be all that different from anything else out there, but as long you had a good, quality product, you would be able to [00:27:00] customers and sell to them. Then there was a challenge of, "Okay, there's so much going on out there competitively that's similar you need to differentiate." There was this need to make sure that your product is different. Whether it's different features, or functionality, different design, whatever. That playing field has also been leveled. Now we're into this customer experience playing field. When companies start [00:27:30] in this environment, you're right, they tend to think about all of that, whereas, I think a lot of the older companies need to have an awakening, they need to realize that the way we've been competing, the way we've been building our brand for so many years is no longer effective. It's a different challenge for them. Kyle Davis: I just feel like sometimes I just want to go up to people and grab them by their shoulders and shake them and say, "Change [00:28:00] everything!" Kyle Davis: As a six foot three male I might scare some people and catch a lawsuit, so I can't do that. Denise Yohn: Gail, we wouldn't want that, right? Gail Davis: Yeah, we wouldn't want that. Denise, what are you working on now? What can we look forward to seeing? Denise Yohn: I'm working on a new book that's called Fusion: How Integrating Brand and Culture Power the World's Greatest Companies. [00:28:30] It's all about this what I've been talking about, starting inside that your brand and your culture need to be integrated. If they are interdependent, if they're mutually reinforcing, you not only have fuel for your organization, you have so much power, but you also have what I call future proofing. I think that you're able to compete better, you're able to create more sustainable relationships with your customers, and you have [00:29:00] more integral business that actually works over time. I'm right in the research phase of all of this and that's why I've read like eight books so far this year already. I'm really digging into learning best practices about brand and culture and how these things work together and I can't wait to share all the research that I'm working on now. Kyle Davis: What are some things, from your research, [00:29:30] that you've done thus far that are maybe changing your mind about a couple of things or reinforcing things or just keeping you at levels of excitement that you just want to run over the hill and shout to the valley? Denise Yohn: One of the things that really got me interested in this topic was something that happened with Amazon, now probably almost a year ago, I think it was that long ago. I don't know if you remember but there was this [00:30:00] scathing New York Times article that come out about the culture in Amazon, and how people were crying and people felt like exploited and beaten down and you know, all this stuff. What I found fascinating was so many people were like, "Oh, I would never wanna work in that company, it's awful experience." Then on the flip side, you heard from all these people who did work at Amazon who said, "You know, yes, our culture is competitive. It's [00:30:30] not as ... And it's exacting and it's demanding. It's not nearly as bad as The New York Times article made it seem. But you know what? The reason why we are so driven is because we want to bring the best innovation to our customers. We are aggressive and competitive inside and because we want our brand to be aggressive and competitive and really win for our customers outside." This idea that not every culture is going to be warm and fuzzy and nurturing and supportive, that you can actually have [00:31:00] a really aggressive culture and still thrive, I think that whole idea started me really investigating this link between if you want be known for something in the outside, you better be operating like that on the inside, and vice versa. As I've been doing more research, I found that these great companies have that link between what they do on the inside is what they do on the outside, and vice [00:31:30] versa. Kyle Davis: One of the things that comes to my mind to segue out of necessarily like tech and tech startups, even companies as massive as Facebook or Amazon, but to go back to ... I went to school in New York City, so a lot of my friends went into consulting. They went to the big firms. We all know who they are. McKenzie, Deloitte, you name it. My friends, they went everywhere. There's this unspoken rule within consulting that wherever you land, if you land on one of those [00:32:00] companies at the entry level position, it's two years of push-up or push-out. You either make it two years or you don't. At two years, you can you join the alumni network or you can go on towards your path towards partner or whatever. I look at those and I go, "Is that something that people necessarily want?" You just questioned that decision of why did so and so join this? Then you see other people are like, "Yeah, that person's gonna be cut out for it [00:32:30] and they're gonna crush it." It's always the person like, "Wow, why did you do that?" They just went to go because the name or something. [crosstalk 00:32:37] I see that a lot in tech, too. You see all these articles on Medium coming out, from like these San Francisco companies where it's like horrible. Denise Yohn: Yeah. Okay, so you bring up New York and I think New York equals finance. Then I go into like Goldman Sachs. They had [00:33:00] a scandal, or whatever you want to call it a few years ago, when you remember Greg Smith, the famous consultant publicly resigned and really tried to pull back the curtain on how, again, how demanding and how elitist the Goldman Sachs culture is. I don't know as much about that case study, but I think that some people love [00:33:30] working at Goldman Sachs because it's like that and they're fit for that. Some people are going to hate it, like Greg Smith. I think that the point is that one culture doesn't fit everyone and that you really ... Right? You need ... you, as an employer and as an employee, to make sure that that fit exists and if it doesn't, then you need to make a change. Kyle Davis: I think another good example is college. A lot of people pick their college because it's maybe where their parents went or some [00:34:00] family members, or they like the color blue, like I do. They chose to go to a certain institution and they ... I went to Columbia and I had friends wash out after the first semester and I'm like, "Why? Where did you go?" They found themselves in another pond and they succeeded, whereas I wanted the rigor and I wanted to be smashed by every book that I ... I didn't even make the dean's list until like my last two semesters, so it took some growing, but that's what I wanted. You had to know what you're getting into and I look [00:34:30] at some people and I go, "You didn't know what you're signing up for? Did you pay attention?" Oh well, whatever. 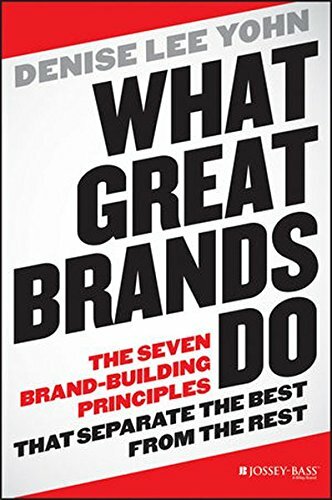 I think if we could just, with regards to the new book and everything that you're doing with your talking and speaking and consulting and focusing on brands, if you can, aside from the seven key principles or takeaways [00:35:00] that you mentioned in your previous book, could you just say if you had to ask a company, or a board, or a founder a question, what would that question be that could help them center or, at least, begin helping them think about their brand, so that they can start going into those exercises to really start improving what they are as a company and what they're about? You know what I'm saying? Denise Yohn: [00:35:30] I think so. I probably would ask one of those questions about your brand purpose. Why do you exist? What would be missing in this world if you no longer existed? I think many business leaders are focused on financial results, and rightfully so. I mean this is business, [00:36:00] right? I think the greatest brands, and maybe the greatest business leaders, pursue profits and pursue financial results in tandem, or maybe in the pursuit of something larger that they really want to make a difference in this world. I really do believe in the power of business to make that positive difference in this world. I think that I would really ... If I had the chance to ask any [00:36:30] business leader, that's probably where I'd start is, "What difference do you want to make in this world?" Then, "Are you making it? If not, why not?" Kyle Davis: That's what I wanted to hear. Kyle Davis: It's a great question to even ask yourself as a person when you think about your own personal brand. Denise Yohn: It's challenging, but I think [00:37:00] that if you're not clear on that, do you expect anyone else to be, right? Gail Davis: Very good. Love it! Kyle Davis: I'm laughing because I think our third podcast that we did was with David Polinchock and he was talking ... He was in a room, he asked somebody, "So tell me about your brand." They gave him like the 15 minute thing, the board memo, instead of the, "Make commerce easier, to simplify life, or to make [email 00:37:28] easier." [00:37:30] I think that's a good way to start, to really get you synthesized. Wow, synthesize? It's the right word, but that wasn't where I was trying to go. Okay, cool. Denise, I appreciate it. I think the book that you have coming out, Fusion, I'm trying to remember where is this at? Gail Davis: How to Integrate Brand and Culture Power the World's Greatest Companies. Kyle Davis: Do you have like an idea, roughly? I know you're just starting the research for it. Do you have like a guesstimate as to like your [00:38:00] date for that? Denise Yohn: I've set my internal date is January of next year. Whether my publisher agrees with me or not we're still working on that. Denise Yohn: Yeah. It's like I want this book to be out now, because it is such an important topic and there's so much interest around it. You will see it Q1 next year, the sooner, the better, as far as I'm concerned. Gail Davis: We'll have to have you back when the book comes out. Kyle Davis: For [00:38:30] sure, yeah. Denise Yohn: I would love this, because this has been a great conversation, so I would love to return, thank you. Kyle Davis: If people want to have a sneak peak at what you're working on with regards to the new book, Fusion: Integrating Brands and Culture Really Helps to Build the Greatest Companies in the World, they can do so by actually booking Denise. Kyle Davis: They can do so by calling GDA Speakers. Do you like this little segue? Denise Yohn: I love it! Gail Davis: I love it! Kyle Davis: And they can call 214-420-1999, [00:39:00] or visit gdaspeakers.com. More importantly, if you want to read the transcripts for today's podcast, you can do so by going to gdapodcast.com, where we will also have a place for you to actually buy the book via Amazon, What Great Brands Do on your transcript page for the show. With that being said, thanks, Denise. Gail Davis: Thank you, Denise. It was great spending time with you. Denise Yohn: Thank you, I agree. Thanks so much. ep. 33 - Denise Lee Yohn: Brand-Building Expert by GDA Podcast is licensed under a Creative Commons Attribution 4.0 International License.